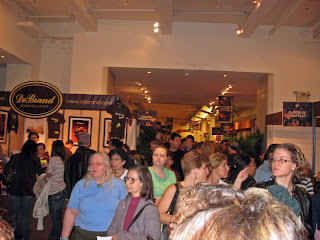 Yesterday afternoon, Friday, November 10th, I went to the 9th Annual NYC Chocolate Show. I arrived there about 12 PM and I already bought the ticket online for $25.05 (regular admission is $25 at the door), including the discount code from Frommer’s; it’s just the shipping and fees TicketMaster kicks in to inflate the charges further instead of $15. But I’m not complaining I avoided the long line waiting to get a ticket in person. When I got into the Chocolate Show, they stamped my hand so I could come back in later on today, if I want, and I checked my coat, which was $2. It was already a crowded place, buzzing with activity: vendors vying to get the attendees’ attention to try and especially purchase their chocolates, book signings with various pastry and candy cookbook authors, cooking demonstrations from pastry chefs and tastings in the Chocolate Lounge. There is no problem getting people to get samples, it’s a given to this show and there are a good amount of people buying chocolate anyway. The hoards of people make me feel claustrophobic. The predominant sales would go to Payard; Kopper’s is actually popular toward the younger crowd as I looked around. As some of you know, I’m a picky chocolate connoisseur and I’m not too fond of Payard because it’s not extraordinary chocolate. I mean, it’s good but not great. I don’t like Kopper’s at all because it’s just chocolate covered nuts and whatnot, so obviously I’m not bought. Those of you who do love Payard’s chocolates, the little purses that have 2 pieces of chocolate bonbons are $3.50, same as the small cube which also contain 2 pieces. I don’t know about Kopper’s because they don’t appeal to me. I bought three items; all are small gift boxes: Cosmic Chocolate’s Cosmic Bombs (4 pieces for $8), Recchiuti’s 4 piece chocolate box ($10) and Marquise de Sevigne’s box of chocolates ($18). The one that is out of the ordinary from what I would usually buy (something elegant in taste and looks, dark bittersweet chocolate and not sweet) is Cosmic Chocolate because of its cocktail inspired flavors. I’m regretting not going to Mary’s chocolates first because I didn’t know where the heck it was until I bought everything and I didn’t bring enough money with me and they don’t take credit cards. So, right now I’m banging my head against my desk for not buying their absolutely exquisite chocolates both in design and in flavor and texture. One company called Mad Mac NYC, sells MACARONS! The ones that Robyn have talked and consumed on copious amounts in Paris and inspired me to search for some in NYC. I was tempted to buy a large macaron (it’s $2.50) but somehow I didn’t act on the impulse of buying one. I don’t know why. Probably because I’m surrounded by 99% chocolate companies, that I’m turned off by macarons? Oh, how my mind works… Anyways, at your disposal, you may see their display. There’s more kimono detail pics in my album (see link at the end of the post). Unfortunately, during their chocolate and green tea tasting in the Chocolate Lounge, someone in the audience asked if they have any retail locations in New York City and the speaker/Japanese translator said, “No, we don’t.” So once again, I’m mentally kicking myself not buying their chocolates. At least there’s always next year to do buy it. The other demonstrations besides the aforementioned, Mary’s Chocolate and Green Tea tastings and the Hershey’s was a bartender who created an alcoholic chocolate drink (they checked I.D.s, by the way), named Arbor’s Delight. It’s a scotch based drink (single malt): liquid chocolate, Grand Marnier, and flamed or burned the orange peel to release the orange flavor and aroma. It’s very smoky, potent; it took over all of the chocolate and orange flavor that left me with a thought of, “Where’s the chocolate?” I could only smell it but not taste it. Only the men seem to like this drink but not the women in the audience. The one vendor that is absent from this Chocolate Show was Jacques Torres. This is a surprise to me since I’ve always read for the past few years that Mr. Torres is usually the front man of this show and for some reason, he chose not to be a part of the show this year. Hmmm…too bad. Another vendor that I would like to highlight in the show is Marquis de Sevignes from France. Besides the fact that they have elegant chocolates (that is quite pricey but I still bought anyway), is that they have a survey out to whoever is interested in trying four chocolate bonbons (chocolate enrobed pieces with a filling): crème brûlée, a dark chocolate ganache (I think it said 80-90% cocoa? ), citron, and a praline. You try each piece, give it a rating from 1 (the worst) – 10 (the best) and any comment you would like to add for each piece of chocolate. I liked all of them but my favorite out of the group was the dark chocolate ganache because it was dark chocolate, smooth, silky, great chocolate scent and it had a good, delicate snap from the outer chocolate shell. The least favorite was the crème brûlée because it was too darn sweet. These chocolates were inspired by their chocolate bar flavors that they are selling now for $5; it’s about the size of what you would get from a Lindt bar, about 3 – 4 ounces. The other vendor that I don’t know too much but really loved their chocolate truffles were from Romanicos Chocolate. I’ve tasted their coconut truffle and a berry truffle…it is sublime! It’s a soft dark chocolate ganache type of truffles and it’s melts in your mouth. Oh…I’m reminiscing that truffle. I also managed to get a couple of samples for another chocoholic friend of mine, Kim, and when she tried it, she had a chocolate-gasm and blocked out from reality for a good minute or so. It really blew her mind how good it was. I was tempted to take a photo of her reaction but I think she would kill me doing so. I’m just reading the Chocolate Show’s program and it said this company is based in Florida. Double damn. Problem is that if I did buy this chocolate, I know I would eat it practically the day of or the latest, today. Speaking of samples, I probably ate half a pound of chocolate yesterday and managed to get almost a pound of chocolate for Kim. Why not? The vendors don’t really care and I want to make my ticket admission worthwhile. All I could say is after spending four hours at the Chocolate Show, I know I’ve eaten probably two to three times the maximum intake of saturated and unsaturated fats and 1,000 calories at least. But it’s the day after my birthday and it’s my own treat of sorts. I might come back next year to get a box of Mary’s and Romanico’s chocolate. If you want to see more photos of the Chocolate Show, click here. that looks like a great day! especially just after your birthday so don’t worry about the fats and kcalories :) thanks for sharing that experience! It was fun. My belly was full of chocolate so it was kind of hard walking it off since I felt a bit lethargic with the sugar crashing and the excess chocolate after leaving that show.